Over the past twenty years I’ve shared my life with horses, yet, I’ve always wondered what took me so long to discover them. Oh, I grew up with childhood fantasies of horses brought on by TV shows like “My Friend Flicka”, “Fury”, “The Lone Ranger” and “Mr Ed,” as well as movies like, “Black Beauty”, “The Black Stallion”, “Lonely Are the Brave” and “National Velvet.” I’m still a sucker today for the contemporary stories of “The Horse Whisperer,” “Secretariat” and the new “War Horse.” Mostly, these are all stories of true heart, guts, soul and love. They pretty much illustrate the fact that man has learned much about life through the wisdom of his horses. Of course, these days it’s easy to forget the impact horses have had on our lives. Before the invention of the automobile, horses throughout much of the world were our only means of transportation. Not only used as ATVs and farm workers (before tractors) but as companions too. And we’ve always learned from the lives of our horses. We’ve learned from their spirit, their sweetness, lust for freedom and their trust in humanity. Yes, today horses are simply obsolete, for all practical purposes. Completely low-tech, high energy and high maintenance, still, every horse owner recognizes their sheer magnificence. Here are ten lessons my horse, Duke, an awesome, 26 year old, 16 hand, chestnut, flaxen-maned, Tennesse Walking Horse gelding has taught me. I should say that I’m not claiming to be an expert in horse psychology nor in horsemanship, western riding, equine science, training or care. However, I have dedicated a large part of my life to the welfare of my horses and to the discipline of modern day horsemanship. For the sake of simplicity, I’ve borrowed a few maxims from a little book I keep in my studio called, “All I Need to Know I learned From My Horse,” by Pamela C. Biddle and Joel Fishman. 1) Horses can’t talk but they can speak if you listen. The heart of a horse is wide open. Unlike us, they do not suppress emotion. 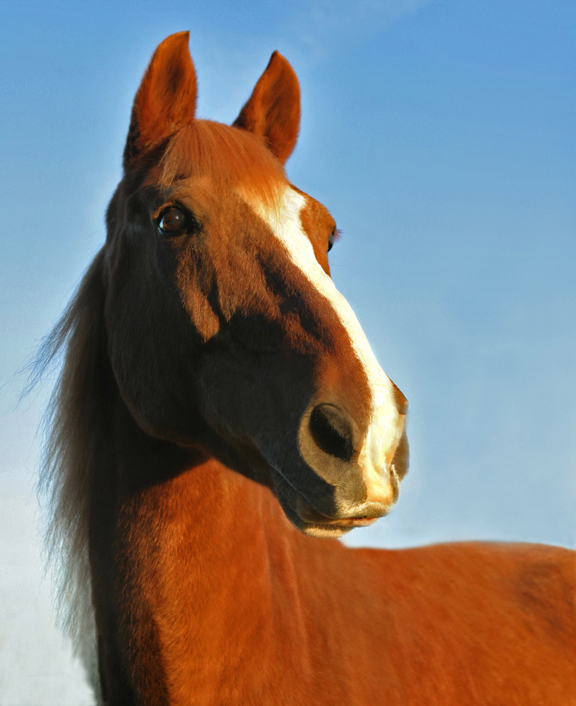 You can communicate with a horse by watching his movements. Position of the ears, sweetness in the eyes, bowing, jerking or shaking of the head, pawing and many other natural body movements are signs of communication. This is how they relate to each other in the wild among their herds. They can read our body language much better than we can among ourselves. Understand this and the horse becomes trainable, bonding with his handler in mutual respect. Part of our training and our job as actors/voice actors is to “listen” well and observe closely. Before we can bring a character to life... one who really touches people’s hearts...we need to practice and refine this behavior. Listening closely works pretty well in business too. 2) A steady hand is better than a harsh bit. They muscled their horses about as slaves rather than with the modern philosophy of partnership. Partnering is a term used today in business. To me this is achieved through understanding, grace, trust and good communication skills with clients and associates. 3) You learn more from a bad ride then a good one. A bad ride can more likely be blamed on the rider and not the horse. While learning to ride, I realized that horses are calm and cooperative when you are. I’ve always been somewhat hard-headed... or so I’m told, sometimes learning things the hard way. A key to business success is learning from your mistakes rather than repeating them. Then riding on down the trail with confidence and know-how. 4) Once the jump is under you it’s too late to look at it. Horses sometimes have more sense than people. They just keep moving forward. Learning from our mistakes is vital but dwelling on them is fruitless. What’s done is done. The attention span of a horse is only 3 seconds. After that he’s ready for the next thing. Likewise, after the botched audition, instead of beating yourself up about what you could have done better, it’s best to put it out of your mind. It’s too late to go back and do it again anyway. 5)A good heart beats a pretty head every time. It takes more than just being a purebred to make a great horse.Those of you who feel much freer and more comfortable behind the mic than in front of the camera can relate to this. As voice actors, our best performances are those that reach out and touch the listener. Who cares how pretty we may look behind the mic? Microphones can’t see, they can only feel. 6) A swish of the tail at regular intervals keeps most pests away. A simple natural action. In other words, watch your back! Trust is commendable but naivete can be detrimental. Brush aside the naysayers and focus on moving forward. Rely on your own judgement but look back once in a while to keep predators at bay. And to see how far you’ve come. 7) Know the course before you mount the horse. The horse surely knows the way. If you are new to voice acting (or any other skilled profession) do your homework before getting in too deep with equipment expenses, client services, marketing expenses and such. A young foal learns to trot before he can canter. There’s a wealth of resources available on the World Wide Web, your public library or community book store. Read up on your new profession. 8) Riding well is the best revenge. Show off your riding skills. As I said earlier, keep the naysayers at bay as well as other negative influences. Concentrate instead on being the best professional you can be. Revenge is sweet when you’ve become accomplished... leaving others in the dust who are lazy, misguided, unskilled or unscrupulous. 9) Never end an exercize on a bad note. To build confidence leave the session on a happy note. The best way to do this is to ask the horse to perform something he already knows how to do. He leaves confidently, ready for the next session. End your own recording session, phone conversation or email message on a good happy note. Stay positive and forward-thinking when dealing with clients and with the industry as a whole. 10) Graze in the same spot too long and you’ll end up with a mouthful of dirt. Horses always find the green grass. Gaining new ground in any business is vital to its prosperity, longevity and growth, especially a business such as voice acting accomanied by so much high technology. But then again, what business today isn’t? Keeping up with and understanding its evolving phases will help keep your business in the spotlight. On Friday, February 3, 2012, my beloved horse, Duke, passed away. He was 26 years old... 78 in human years. One of the hardest things in life I’ve ever done was to let him go and allow him a dignified death. Despite the years of care and love we gave him, time and an injury took it’s toll on his aging legs and he could no longer support the weight of his own body. 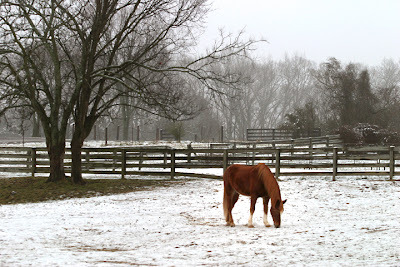 Duke is survived by Majik, our 16 year old chestnut, flaxen-mained Arabian mare and Jett, our black, 12 year old Tennessee Walking Horse gelding. Along with our two beautiful dogs, Jessie (F), a 10 year old, Red Tri Australian Shepherd (Aussie) and Cody (M), a 10 year old Shaded Sable Shetland Sheepdog (Sheltie), our 11 year old barn cat, Pistol and newly adopted family member, (abandoned by a neighbor) a handsome, multi-colored rooster, Rowdy. And of course by wife, Mickie, and myself. I hope you found this article beneficial to your business and personal life. It has allowed me to collect my thoughts and most certainly was theraputic in honoring the memory of my first horse, Duke. May he rest in peace in Horse Heaven.